Updated July 30, 2014, at 1:46 p.m. EDT. Hundreds of supporters of the Obama administration's flagship climate change rule turned the grounds around the U.S. EPA headquarters into a green carnival this morning as the agency opened the first public hearings on the proposal in Washington, D.C.
Stoking enthusiasm outside the William Jefferson Clinton Building were the Climate Reality Project and Ben & Jerry's, which handed out free cookie dough and fudge ice cream to rule backers -- notably children organized by the Moms Clean Air Task Force. The group is also staging "play-ins" at the other three EPA listening sessions this week in Atlanta, Denver and Pittsburgh. Eight-year-old Logan Sheehan interrupted his pre-rally parachute play to say this wasn't his first go at civic engagement. He had already met Sens. Ben Cardin (D-Md.) and Robert Menendez (D-N.J.) at a similar event last month at the Capitol, he said. Asked what he remembered about that event, the rising third-grader answered, "Not much." He'll join his mom, Trisha Sheehan of Winona, N.J., who's scheduled to testify in the Clinton building later today. Sheehan said she first became engaged in environmental issues after last September's Paulsboro, N.J., train derailment, which released toxic fumes into her town's air. "Something bigger than me needs to be done to protect my children's future from dirty air," she said. "So that's what really spurred me into activism." 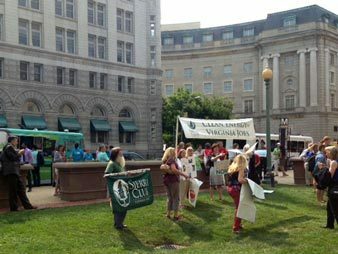 The outdoor rally coordinated by major environmental groups -- including the Sierra Club, the Environmental Defense Fund and Environment America -- featured whirligigs, bongo drums and speeches. Sen. Ed Markey (D-Mass. ), fresh from his testimony in support of the rule, told the crowd that U.S. engagement on the issue is important, even before other countries take similar steps. 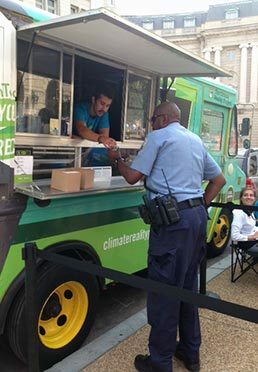 A Climate Reality Project truck handed out scoops of Ben & Jerry’s ice cream outside of U.S. EPA’s Washington, D.C., headquarters this morning. Photo by Robin Bravender. "We can't preach temperance from a bar stool," he said. "We have to be the leaders if we want China and India to follow." The coal industry's lone outdoor ad was an electronic billboard parked on Constitution Avenue in front of the Clinton building. The American Coalition for Clean Coal Electricity offering faced off against another video billboard sponsored by the Climate Action Campaign, which helped coordinate messaging for national environmental groups. At the hearing, EPA staffers sat at a table listening as commenters came forward two by two to give testimony on the June 2 proposal, which could lead to a substantial restructuring of the electric power system as it seeks to reduce the sector's emissions by 30 percent below 2005 levels by 2030. The lineup of speakers included several politicians. Markey was joined by Sen. Jeff Merkley (D-Ore.) in morning testimony, while Rep. Shelley Moore Capito (R-W.Va.) testified against the rule in a separate room. Capito said in her prepared testimony that the rule would be disastrous for her state's coal-based economy. "With this unprecedented rule, the EPA has gone far beyond requiring existing coal plants operate as efficiently as possible," she said. "Instead, the very framework for this rule is built around shifting the country away from coal. The federal government has no business picking winners and losers in the energy economy, but that's exactly what the EPA's new rule would do." The hearings, which will continue in Washington, Denver and Atlanta tomorrow and Pittsburgh on Thursday, are aimed at providing EPA with feedback on its proposal. The agency's acting air chief Janet McCabe stood in the back of the hearing room through part of the morning's testimony. National environmentalists have made protecting the rule from congressional and industry attacks a top priority. Their leaders expressed optimism this morning that they would succeed. Advocates of EPA’s climate rule held up signs of support outside the agency while friends and foes of the draft regulation squared off inside. Photo by Robin Bravender. Collin O'Mara, the National Wildlife Federation's newly minted president and CEO, said the environmental community would continue to present the rule as workable. O'Mara, who previously worked as chief of Delaware's Department of Natural Resources and Environmental Control, said his time there proved to him that regional programs like the Northeast's Regional Greenhouse Gas Initiative can succeed and can be cost-effective. "Using that as a counter-example to some of the talking points on the other side" should be effective, he said. NWF's plan will be to work with "more moderate" lawmakers of both parties to avoid a fight over the rule, he added. "I am absolutely committed to being much more focused on protecting wildlife and connecting more folks in their communities," said O'Mara, who just oversaw a staffing shakeup at NWF (see related story). That local focus is in part due to the gridlock in Washington, he said. Fred Krupp, president of the Environmental Defense Fund, said the rule has more supporters than its opponents believe, in part because of the method EPA followed in writing it. "I think there's great appreciation around the country including from some public business for the fact that Gina McCarthy went out and listened to the concerns of people in the business community and incorporated a lot of the flexibility they were looking for in the rule," said Krupp, who has worked with business interests on similar issues in the past, including to enact cap and trade. Krupp said that although the power plant rule is important, it is not the only action EPA can take to protect the climate. His group has worked extensively to improve data on methane released during natural gas development and has urged the agency to consider rules for those heat-trapping emissions. "We could get roughly the same benefit in 2025 from a good rule closing methane leaks as we could get from the power plant rule," he said. The White House set up this week's listening sessions by releasing a report this morning warning of the economic costs of delaying action to address climate change (ClimateWire, July 29). At EPA's Region 8 headquarters in Denver, testimony also skewed in favor in the regulations among the first few witnesses to speak during an expected 11 hours of statements. Retired Kentucky coal miner Stanley Sturgill, who also advocates for mine safety, praised EPA for proposing new regulations but called on the agency to offer a more stringent version of its plan. "The very reason I'm here today, the reason I flew from Kentucky to Denver, the rule does not do near enough to protect the health of the front-line communities. ... We're literally dying for you to help us," Sturgill said. His remarks drew a show of silent applause -- in which individuals raise their hands and wiggle their fingers -- from a half-dozen adults and children in the audience dressed in turquoise T-shirts with the statement "I [heart] Clean Air." Those objecting to the proposed rules framed new regulations as an economic disaster in waiting. "The environmental extremist war on coal is really a war on prosperity both for Moffat County and for the nation. ... Energy is the lifeblood of our economy," Moffat County Commissioner John Kinkaid said in the first remarks of the session. "This isn't some abstract bureaucratic exercise to the people of northwest Colorado, to us this is personal." During the first hour of the hearing, testimony in one of two rooms set up for the session was periodically slowed by technical difficulties as microphones provided to witnesses failed to work, and at one point sound from another room was apparently piped into the hearing room. Reporter Jennifer Yachnin in Denver contributed.